Laminitis is a painful hoof condition that affects the laminae, which are the soft tissues attaching the pedal bone (coffin bone) to the hoof wall. 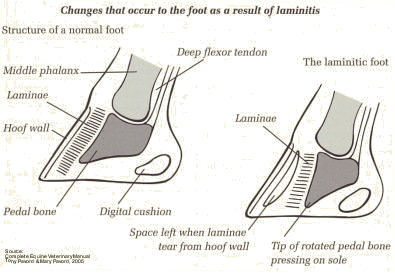 Disruption of blood flow results in inflammation of the laminae, and if not treated can lead to separation and rotation of the pedal bone away from the hoof wall. Laminitis most commonly affects the front feet, however can also occur in the hind limbs. If recognised early, long term effects can be avoided; however, chronic laminitis can lead to ongoing pain, unsoundness, and even penetration of the sole by the pedal bone. As the exact cause of laminitis is not completely understood, prevention and successful treatment is often limited. Currently a lot of research is happening about laminitis and its causes, and hopefully more information about this frustrating disease will become available soon. Several causes and risk factors contribute to the development of laminitis. 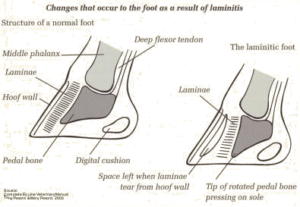 An important fact to understand is that many of the causes of laminitis do not directly impact the hoof, but produce a systemic disease that subsequently affects the small blood vessels of the laminae within the hoof. Although ponies are highly prone to developing laminitis, any type of horse can be affected. Diet is a major contributing cause of laminitis. What are the stages of laminitis and how can I recognise them? Developmental: This stage involves changes in blood flow to the foot due to systemic factors resulting from disease. The laminae of the foot remain intact during this stage. Symptoms are often subtle and difficult to notice. Acute: This phase of laminitis can be identified by increased pulses at the fetlock, increased hoof temperature, difficulty in getting up, excessive time spent lying down, reluctance to move and the onset of pain seen as shifting weight between limbs, and lameness. The horse may adopt a characteristic ‘sawhorse’ stance, where the hindlimbs are pulled well under the body and the forelimbs are stretched out, in an effort to reduce weight over the forelimbs. With early intervention, recovery is possible at this stage. Chronic: This phase is defined as either displacement of the coffin bone within the hoof, or after 72 hours of continuous clinical signs, especially pain. With early intervention, many laminitis cases can be successfully managed. However, unfortunately there is no specific cure. The most important aspect of treatment is early identification, removal, and/or treatment of the cause. For example, if the inciting cause of laminitis is obesity, the horse’s diet should be restricted, with weight loss as the goal. Radiographs (x-rays) before treatment starts, to assess any damage within the hoof, and serve as a comparison during treatment. Increased cushioning under the sole of the affected feet. Farriery techniques to correct forces placed on the coffin bone and hoof wall. Strict rest – including confinement to a stable or small yard, both well bedded, to prevent further damage to the already inflamed laminae. Restricting diet by removing any feed high in carbohydrates (eg. grains). Ice/cold therapy to feet three to four times per day. Although some cases respond relatively quickly to treatment, others may take weeks and possibly even months for a complete recovery. Depending on the severity of the laminitis, gradual corrective shoeing and anti-inflammatory therapy may return the hoof to normal. However, in very severe cases where the coffin bone has penetrated the sole, euthanasia should be performed on humane grounds. X-rays (radiographs) of horses’ foot with chronic laminitis showing rotation of pedal bone (above) and chronic remodeling of the pedal bone and hoof (below). How can I prevent laminitis? As with most diseases, prevention is the best cure, and is far more effective than treatment. Unfortunately, once a horse who has had laminitis will be prone to future episodes. However, repeat occurrences can be reduced with good management. Never over feed your horse or pony. Avoid feeding grain and sugary treats. Don’t allow horses or ponies prone to weight gain to graze on lush pastures. When pasture growth is rapid, restrict grazing by stabling for part of the day, or alternatively use a grazing muzzle to restrict grass intake. Ensure the hooves are regularly attended to by a good farrier, and don’t let the hooves become too long. Regularly exercise your horse or pony. Maintain good health management, including vaccinations and worming to avoid any illness that could predispose to laminitis. Assess your horse’s the body condition regularly, to ensure weight gain is not occurring. After foaling, ensure the mare is checked for retained placenta. For horses with severe injury or lameness, controlled exercise or physical therapy should be implemented.